E’s World: It’s all about the shoes. amm I look good! My Lala got me a new pair of Chuckies (Chuck Taylor Converse) and they look good on me. Got me some new threads too from my uncle. I love being a kid. I hang with my friends all day in school and keep busy playing with my toys and get lots of attention and love. My Ampa got the same Chuckies so we are all good. He says it is a bucklist item for him. It was given to him as a gift from Nana (Auntie Talia). I love hanging out my Ampa. Lately, he and I been hanging a lot together and taking lots of pictures. He tells me things that does not make sense, so I just tell him just ‘chillax’ Grampa. Just YOLO! Tomorrow, my Ampa is going to start his treatments again. I know he has a hard time with the side-effect, so when I can I comfort him. I still have to understand what makes him sick. Maybe it is like when I get colds and I have to drink this nasty liquids which is suppose to make me feel good. They are nasty. My mom would chase after me and hold me tight just to make me drink my medicine. How come you have to drink the bitter medicine (of life) before you experience relief or the sweetness (of life)? Maybe it must go together. Complicated. You know what is not complicated? My Buzzlighyear, my toys, and my Mack truck. 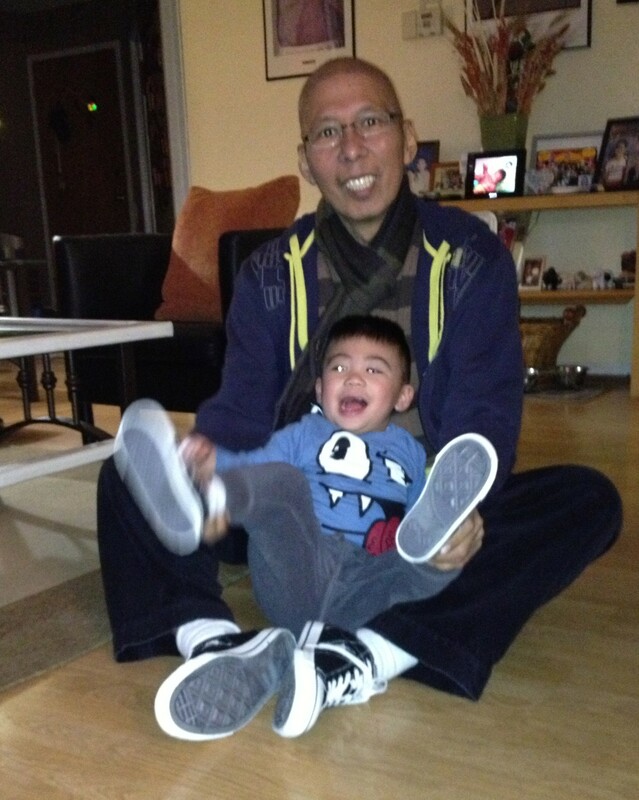 I got to teach Ampa to enjoy more his life and ride the YOLO train. Got to go. Mom is calling to give me a bath. “Coming, mom!” Listen, I have a request, if any of you want to write a posting in my Ampa’s blog just let me know, I will hook you up. Now is the time. “How are you doing?” The text from my friend Paula reads; like others she wants to know the results of my CT scan or just be updated. She caught me in the patient waiting area anxiously waiting to be called for a guided ultrasound to drain the ‘large’ volume of fluid in my abdomen. “Living my life story.” I replied back to her. It was a cryptic reply to an already stressful day. I had my CT scan yesterday after having it postponed last week. This morning my oncologist called–in the middle of a conference call–to give me the news; the good news is the metastatic pulmonary nodules in both my lungs have shrunk and there are no new lesions; the not so good news is the build up of fluids in my pelvis and abdomen. This is giving him concern and would like an immediate paracentesis procedure done to drain the fluids in my abdomen and have it examined for any cancer activity. That seems to be my life story: Endless medications, procedures, blood test, treatments, side-effects, etc. After a hectic morning, I managed to squeeze in my blood test done in preparation for paracentesis in the afternoon, while trying to manage my workload. I am dazed as I go in and out of the hospital the whole day. The good news from my lungs did not even sink in because of new challenges always pooping my way. I am tired. The paracentesis procedure was less painful than what I expected. They puncture a hole in abdomen using local anesthetic, a needle is inserted, and a large syringe removed fluid sample to be taken to pathology for malignancy test. Then the rest of the fluids were drained; all 1700cc of it or almost two liters, could you imagine that? Some how a two liter bottle of Mountain Dew will not look the same to me. What next? We wait for the pathological results and see if there is need to change my treatment plan. In the meantime, I trying to gain weight having loss so much from diarrhea and vomits, and continue to make the best of things. Let me now pause and fully appreciate the news; that there are no new nodules and the existing ones have shrunk. That was worth every diarrhea, vomit, and hardship. P.S. I have temporarily given up a vegetarian way of life short of eating red meat. Tomorrow is suppose to be my CT scan to re-stage my canceled. I canceled it because of my persistent diarrhea. For the scan tomorrow, i am suppose to drink this prep drink for contrast and current condition it would be a difficult situation. Life has a way of changing you. inally, it is here. I could get my Downton Abbey Season 3 fix. If you are one those who follow this TV drama in PBS you know the feeling. It is unfair that First Lady Michele Obama got to see the whole season ahead, oh well. I don’t watch too much TV but I make an exception to Downton Abbey; besides it is commercial-free in PBS, which is home to Big Bird…if you know what I mean. (Note: For my international friend, during the debate on tax cuts, the Republicans threaten to cut funding to PBS, home of Sesame Street: Big Bird and his friends. Don’t touch Big Bird was the cry). The TV drama series has a huge following here in the US. “Life has a way of changing you.” It hit me. Life has force me to changed. I, at times, would look back at my long journey and compare my life before cancer and my present one. I have definitely change for the better inspite of the things I have given up, like red meat. You have to change to get better and find out more about yourself. Sometimes you have to fears in order to improve or get the most out of life. It is like jumping out of an airplane to face your fear of height, right? My fear is my mortality. I get tested with it every other week during chemo, which I cannot get use to. However, when you look at the long road I have taken since March 2008, I have survived them all. I have made so many friends along the way. I have discovered myself and I think you have too with the stories I tell. I am glad that I have changed because I am able to appreciate life more fully now. I have another milestone coming: re-staging my cancer. This Thursday, January 17, I will have my CT scan to verify if I am responding to my current treatment using the new chemo drug, Zaltrap. Oh yes, I have done many scans before and I also have received good news and bad news from the results This time, I am hoping for good news that my nodules are gone or at least have shrunk. What can I say, except thanks for your support and prayers. Will let you know. Onward with my real-life drama. P.S. NYC marathon have opened up the registration for 2013 for those who were not able to run the canceled 2012 marathon. I will decide if I will run 2013 after my scan results.